If There’s Such a Thing as Foodscaping, How About Berryscaping? I wrote Monday about foodscaping and showed you a photo of my vegetable garden that incorporates flowers and herbs as well. All throughout the discussion of edibles that I have been having here, I said that I don’t grow too many fruiting plants. There are a couple of reasons for that. I was into habitat gardening and established my “habitats” or wildlife gardens long before I ever established dedicated to grow food. And while that wonderful book I talked about Monday, The Foodscape Revolution makes clear that you can grow food anywhere and everywhere, if you are gardening for wildlife you are going to be competing with that same wildlife for the food you are growing and so you are going to have to create some sort of effective fencing to separate your food from them. I’ve talked a little about that little issue before. The Spoiler is opposed to fencing of any sort. And then he wonders why he has no blueberries and isn’t getting tomatoes. You reap what you sow! And when what you sow isn’t protected from all the hungry critters that romp through your yard after you’ve invited them in, well, them you don’t reap very much. But this surely doesn’t mean that there are no ways to grow fruit crops in landscapes. For one thing, many of them make great container plants. Some of the smaller varieties are even suitable for balconies and patios. And some of a new line of fruiting berry plants called Bushel and Berry™ have been specifically bred to be both beautiful and prolific. There are 7 plants in this line. Most are blueberries–there are 5 different blueberries–and a raspberry and a blackberry. All are self-pollinating and compact making them perfect for landscapes or containers. Their marketer is Star, who also markets the Drift™ and Knockout™ series of roses and a hydrangea which is completely unfamiliar to me called LA Dreaming. You can read all about the plants here. I have to say that my attempt to grow two of these plants has been a dismal failure–both have died. Perhaps I didn’t give them large enough containers. 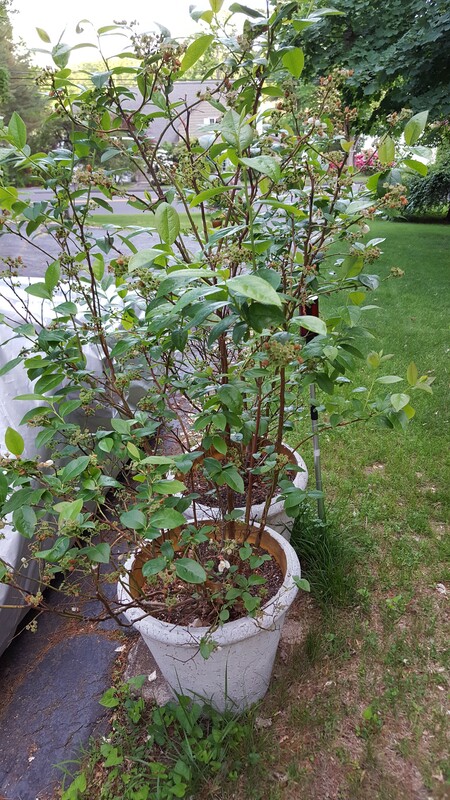 I do have two other full size blueberries in pots (shown above) that are doing just fine, so go figure. But I adore their blueberries, especially the variety called Peach Sorbet. The colors the foliage turns in the fall is wonderful. 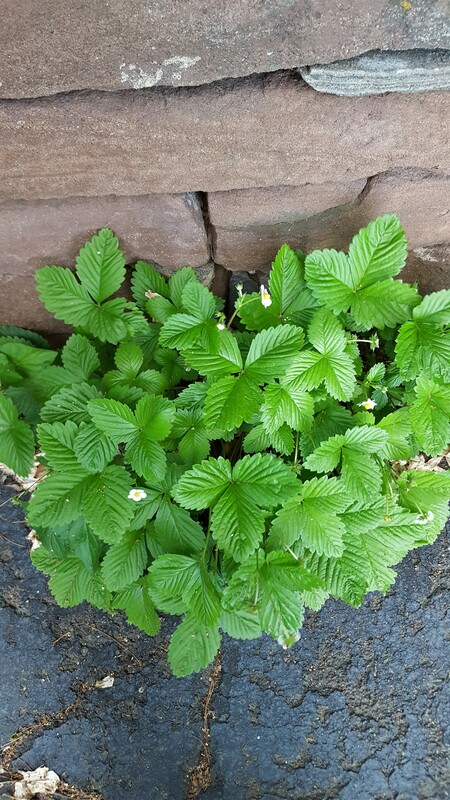 Another great plant for beds, borders and just about anywhere is the alpine strawberry. This incredibly hardy strawberry will give you tiny strawberries all summer long, up to a hard freeze. It has great fall color–vivid scarlet–and when you have to fight chipmunks or squirrels for the fruit, don’t despair. They will actually plant more of these plants for you. I have them self-sown all over my property, even into other containers. I started with 5 plants. I now must have 50 thanks to my wildlife. And I am keeping them all! So in answer to my question: yes, berryscaping can be a “thing” too. Just be mindful of sharing with your wildlife!